Some of my best genealogy research adventures start with accidentally stumbling upon a website. It happened to me yesterday as I was doing research on a family business. I saw a link for San Francisco property records and decided to click on it. What I got was the “San Francisco Property Information Map” website. From what I see, this applies to properties that exist today. This will help you if your ancestor’s property survived the 1906 earthquake or was built after and still stands. On the left hand side, the building on the property is marked with the violet colored box. On the right, is all the information known about this property. There isn’t much data before 1980. There are links to the 1990 Sanborn Map and the location on Google Maps which further helps identify the building. For some reason, several of the addresses I looked up showed the back of the building on Google Maps rather than the front. You print the information by using the link in the right hand corner of the report. San Francisco Call, 28 July 1912. This building contract was the start of Charles Segalas & Co., liqeuer manufacturers. That is, until Prohibition, when he cleverly changed his business to medicinal concoctions. My Dad told me that they continued to make alcoholic beverages with a wink and a nod from local authorities. He was still in business at the time of his death in 1949. I’m not too sure, but family lore leads me to believe that his two sons took over the business at that time. Further research is needed to confirm that part. The best part of this website may be what is found under the Preservation tab. Clicking on the Preservation tab leads to information on the historic status of the building. If the building was included in a historic survey, the report and/or photographs are included. 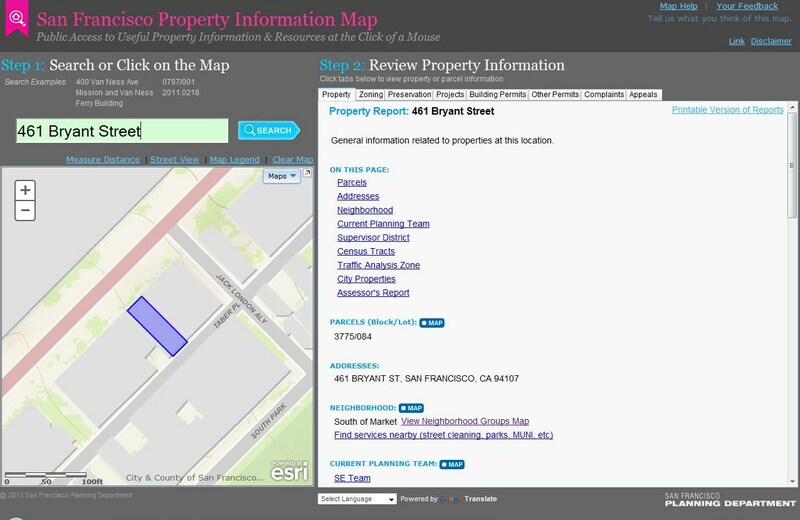 The official report for 461 Bryant can be found in A Form Report (this is a PDF file). The report on 461 Bryant was done in 1995. I learned that it was built in the “Exotic Revival” style. I have no clue what that is, but I’ll be looking it up. The building was considered to be in good condition when it was surveyed. There is no mention of Charles Segalas, though there is a note about the current owners. There are other pages in this report, but for some reason were not included. The best part of the report is the inclusion of both front and back photos of the building. If you’ve used Google Maps, you know that sometimes the building that shows up for your address in street view isn’t always the one that matches the address you searched for. If you can’t zoom in on the address on the building in street view, you can’t always tell which building matches which address. But now I know! 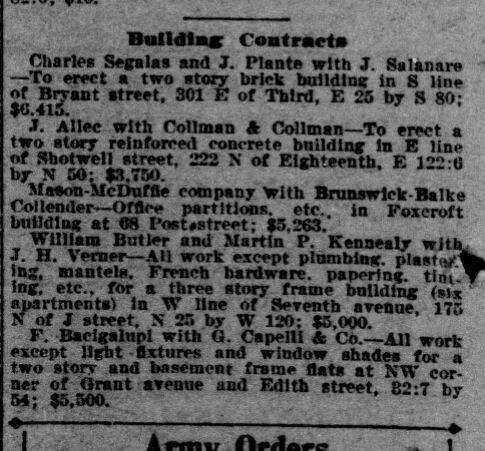 I am happy to say that the brick building with the word “SELLAND” on the facade is the building that Charles Segalas, J. LaPlante, and J. Salanare had built in 1912. All in all this was a wonderful adventure! I was able to locate several other buildings that my San Francisco relatives lived in. Though I may not have photos of the people, I now have photos of the places they lived and worked.